THE Copperbelt Museum has said the bill of quantities for use in the periodic valuation of a multi-billion Kwacha science and technology museum will be submitted by the ministry of Transport, Works, Supply and Communications in the next two weeks. Copperbelt Museum director Charity Salasini told the Sunday Times during the week that this was as a result of the successful compilation of a conceptual framework which would generate and institutionalise a comprehensive design plan of the modern museum. The museum and related infrastructure shall be designed with the ‘homestead’ concept in consideration. The first part would present the practical definitions, passion, motif and concept regarding the museum of science and technology while the second measure would constitute galleries and museum interactive spaces with the associated collections and operational spaces. The third segment would be the community interactive forums and corresponding infrastructure while, the fourth fragment would be the complimentary services to the museum establishment which would include the hotel, conference hall, restaurant and auditorium. “The concept is derived from the traditional technique of arranging family homes in most villages in Zambia which depicts an assemblage of structures each with its own function independently united with the whole,” she said. Ms Salasini said the financing of the development of the museum and associated infrastructure would be achieved through the Private Public Partnership. “Furthermore, different partners would be able to fund areas of their interest independent of the other,” she said. Many stakeholders’ and tourists have complained over the size of the Coppperbelt Museum and how inhibiting it had been to the institution to conduct its operations. They have since called on Government to accelerate the development of the Museum of Science and Technology. 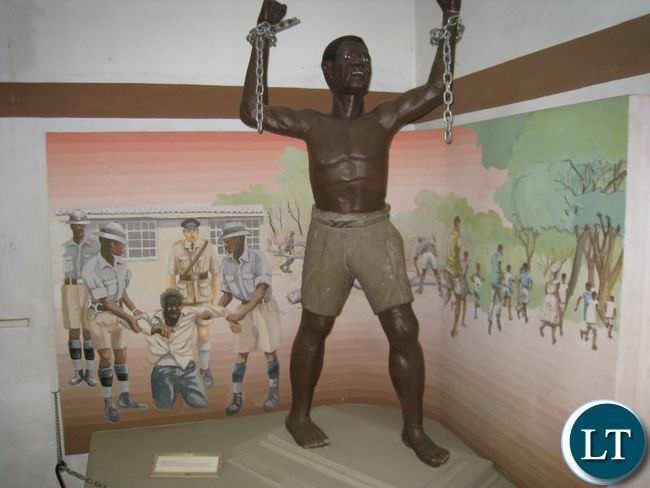 AMA MUSEUMS YA MU ZAMBIA ONE WOULDN’T REAL KNOW WHICH THEME THEY ARE BASED ON. YOU SEE, BEFORE YOU DO A MUSEUM IT IS WISE TO VISIT WORLD RENOWNED MUSEUMS FOR THE PURPOSE OF LEARNING HOW THEY SET UP MUSEUM AND HOW THEY COME UP WITH THEMES. A MUSEUM IS NOT JUST A COLLECTION OF CLUTTER LIKE I SAW AT LUSAKA MUSEUM. EG YOU CAN HAVE A RAIL, SCIENCE, ZAMBIAN KINGDOMS (WITH ALL STATUES OF KINGS OF ZAMBIA AND NOT JUST LITERATURE), THE HISTORY OF ZAMBIA, MINING, GEM STONE, PEOPLE OF ZAMBIA, PLANTS OF ZAMBIA, ETC. I WOULD ADVICE THE MUSEUM AUTHORITIES TO VISIT VICTORIA AND ALBERT, SCIENCE, RAIL, TATE MODERN MUSEUMS, ETC TO LEARN SOMETHING. please do n’t put up such statue like the one in this article. it sis not appealing.